The heart is the symbol of love and commitment, so show the greatest love and commitment to that special someone in your life and get them a Double Heart CZ Necklace in Sterling Silver. The beautiful design features two joined hears made of Cubic Zircona stones, set in fine sterling silver. The double heart pendant is just over 9 X 11 mm and is adorned with 16 accent stones made from stunning Cubic Zircona. The color and brilliance is a great as diamonds and the sterling silver echoes that shine. The pendant comes with an 18 inch long sterling silver chain and also comes with a 2 inch extension piece. Catch people's eyes and show them that love is first and foremost in your life with this gorgeous Double Heart CZ Necklace in Sterling Silver set today! This one of a kind luxury jewelry design will turn heads and take any look from drab to fab! 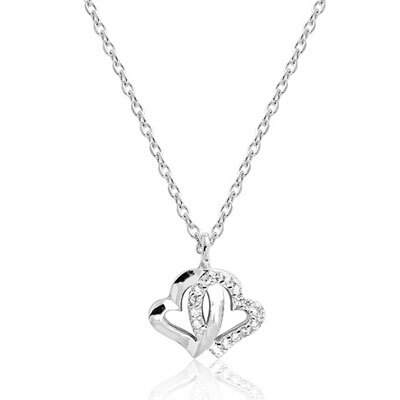 We guarantee our Double Heart CZ Necklace in Sterling Silver to be high quality, authentic jewelry, as described above.